Presented by Herodotus, the famour Greek Historian of the 5th C BC. Geography– with a huge map of Ancient Greece 9 ft square, in chronological order we explore Crete, Thera, Sparta, Thrace, Athens, Macedonia, Troy -with children taking part in naming them – and understanding THERE IS NO GREECE! History – from the Bronze Age through to Alexander the Great, including study of Crete, Thera, The Olympic Games, the Polis, Philosophy. Writing -We study the Greek alphabet. Children all have a pre-prepared worksheet with lots of questions to answer, and detective work/translating Greek characters into ‘English’. Role-Play – All children will assume a Greek name for the day [names provided]. 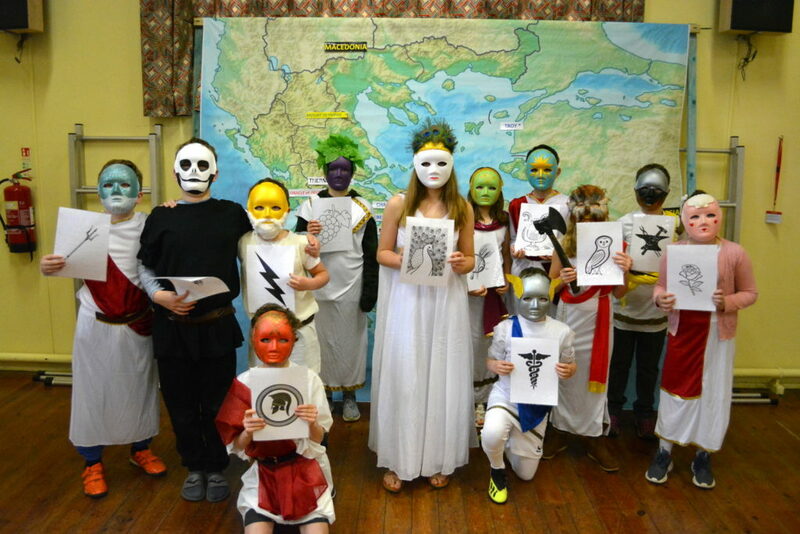 Gods & Monsters– The Greek Pantheon are brough down from Mount Olympus into the classroom using high quality masks. The stories of Perseus & Medusa, Theseus & Minotaur, Hercules 12 labours are all role-played with dressing up, masks and artefacts. Warriors – Introducing the Hoplite and Spartan warrior, with discussions on Marathon and Thermopylae, Persians and the Peloponessian Wars. The Trojan War the grand finale, a wondeful opportunity for drama and role play- 15 principal actors : Agamemnon, Menelaus, Helen, Achilles, Patroclus, Odysseus, Sinon, Nestor, Ajax, King Priam, Queen Hecuba, Hector, Paris, Cassandra, Briseis plus supporting cast. And we have a real Wooden Horse to hide children inside! Powerpoint – Our workshop is fully accompanied by an informative powerpoint presentation, on memory stick – requires school laptop and AV .projection. Timelapse GIF of rebuilding the famous Greek Temple.